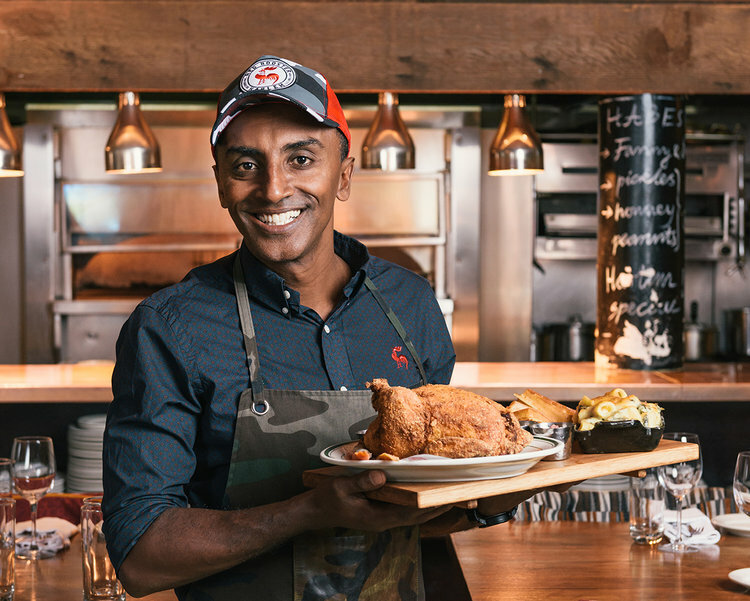 Chef Marcus Samuelsson is an internationally acclaimed chef who caught the attention of the culinary world at Aquavit. During his tenure as executive chef, he received an impressive three-star rating from the New York Times, the youngest person ever to receive such an accolade, as well as his first of five James Beard Awards. An international restauranteur, he has over 30 restaurant locations spanning the United States, England, Sweden, Norway, and Bermuda. In May 2016 he was inducted into the James Beard Foundation Who’s Who of Food and Beverage in America. Marcus is the author of six successful cookbooks, including his latest entitled Red Rooster Cookbook: The Story of Food and Hustle in Harlem. In addition, his memoir Yes, Chef became a New York Times Bestseller and a version was later adapted for young readers. He is also a co-founder of FoodRepublic.com, an online magazine that explores the culture of food through stories, interviews, global conversations, and experiences, which was acquired in 2013. An engaging speaker, Marcus had the pleasure of taking the stage at the World Economic Forum in Switzerland, EAT Conference 2018 in Stockholm, and TEDxHarlem. In 2009, Marcus was honored as a guest chef at the White House where he planned and executed the President Obama’s first state dinner for 400 guests, which he considers a highlight of his career. He is also on the US State Department’s American Chef Corps, which seeks to enhance formal diplomacy, cultivate cultural understanding and strengthen relationships through the shared experience of food. A committed philanthropist, Samuelsson co-produces the annual week-long festival Harlem EatUp!, which celebrates the food, art, and culture of Harlem. Samuelsson is co-chair of the board of directors for Careers through Culinary Arts Program (C-CAP) , which promotes and provides career opportunities in the food service industry for under-served youth, through culinary arts education and employment. Marcus has competed on and won both Top Chef Master and Chopped All-Star, and has also served as a recurring judge for Chopped and The Taste. He regularly appears on popular television shows including Late Night with Jimmy Fallon, Martha Stewart Show, Today Show, LIVE with Kelly,Good Morning America, and more. Marcus recently completed filming his new TV series titled, “No Passport Required,” with VOX/Eater and PBS which will air six episodes weekly beginning July 10th 2018.